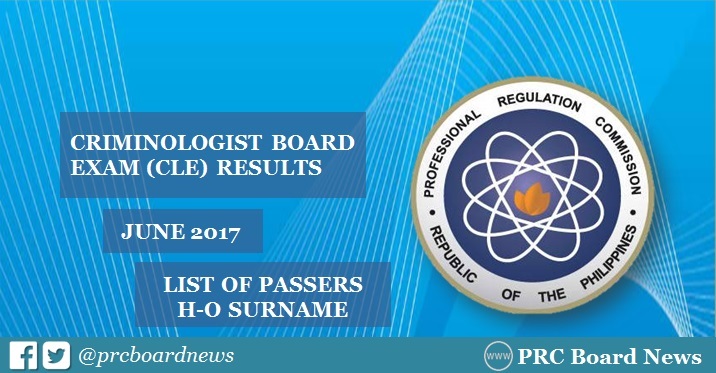 The alphabetical list of passers (H-O Surnames) in the June 2017 Criminology board exam also known as Criminologist Licensure Examination (CLE) is now posted here as results were released today, June 30. The Professional Regulation Commission (PRC) and the Board of Criminology administered the Criminologist board exam on June 11, 12 and 13 (Sunday to Tuesday) in Manila, Zamboanga and all regional offices around the country. The Verification of Rating (VoR) page of PRC for June 2017 Criminologist board exam is expected to become available in few days after the release of results. To verify ratings, for all examinees, enter the required information - exam name, exam date, application number, name and birthdate.